CWTCU | What Does CWTCU Mean? 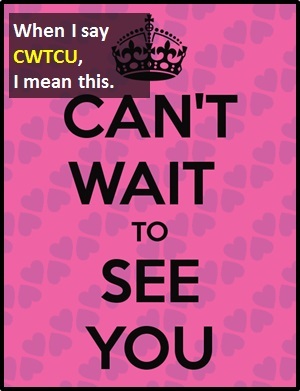 CWTCU (or CWTSY) means "Can't Wait to See You". Person A: I'll be home before midnight. CWTCU is used as a standalone declarative sentence (i.e., a statement), which translates best as "I cannot wait to see you." In other words, it is not used as another part of speech within a wider sentence. Before the digital era, we might have said something like "I'm dying to see you" instead of CWTCU.